I preached the following sermon last night, April 14, 2017, at Hampton United Methodist Church’s Good Friday service. 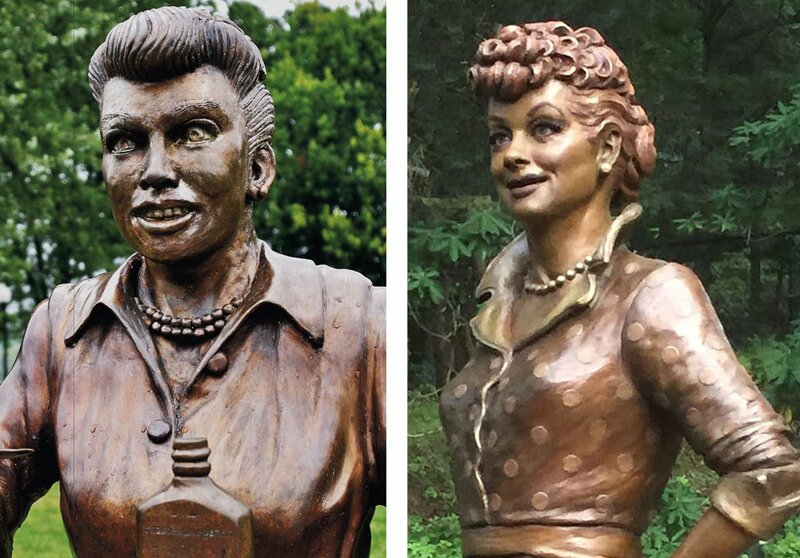 Last August, the mayor of Celeron, New York, unveiled a bronze statue to honor hometown hero Lucille Ball on the occasion of her 105th birthday. Which sounds great. What town wouldn’t be proud to honor an actress and comedian as funny and accomplished as Lucy herself with a statue in the town square? And it’s a lovely statue. Looks just like the Lucy I remember from reruns of I Love Lucy and The Lucy Show. Well… At least the town of Celeron, New York, finally made it right. Yet we want to be remembered… I remember Kim, a beautiful young woman who was a classmate of mine at Henderson High School. I won’t dare say her last name for fear of embarrassing her. But I remember an evening in May of 1988—the night of the “Miss Henderson” Pageant. Kim was a contestant in the pageant. And during the question-and-answer portion of the program, she was asked the following question: “What do you hope your legacy will be?” What do you hope your legacy will be? Great question. And poor Kim, her face froze. She had the proverbial “deer in the headlights” look, as it became clear that she had no idea what the word “legacy” meant! Look, I’m sure she’s gone on to accomplish great things! But we all want to have a legacy. We all want to be remembered. He’s usually regarded as the “good guy” in the story. But keep in mind: Although he’s often called “the thief on the cross”—and I’m going to refer to him as “thief”—theft was not a capital crime, as far as the Romans were concerned. While he might have killed some people in the commission of a robbery, it’s more likely that he was a terrorist or a violent revolutionary who killed innocent people while trying to harm the Romans. My point is, he’s not really a good guy. So this is Satan’s fourth temptation: for Jesus to save himself from the cross, just as he was tempted earlier to save himself from starvation. And makes no mistake: he could save himself from the cross if he wanted to. When he’s arrested in the Garden of Gethsemane, he tells his disciples to put away their swords. He said that if he wanted to, he could ask his heavenly Father send twelve legions of angels—which is at least 72,000 angels—and they could wipe out everyone of Christ’s enemies right where they stand. Rick Warren, among others, has said that it wasn’t the nails that held Christ to the cross; it was his love. That’s exactly right! He could have saved himself. But then… He wouldn’t have saved us. Is there something or someone in our life besides Jesus that we really can’t live without? Is there something or someone besides Jesus who’s at the center of our lives? I suspect there is, because when that person or thing is taken away—or when some event in life threatens to take it away—that’s probably when we do our best praying. Right? Or let me put it this way: When are we more likely to pray? And go to church? And read the Bible? When everything in our life is A-OK? When life is smooth sailing? When there isn’t a figurative cloud in the sky? No. We tend to get on our knees and pray most earnestly when we fear that we’re going to lose whatever it is that’s more important to us than our relationship with Jesus. But never works. Our devotion to Jesus in such cases doesn’t last long. The moment we get whatever it is that we think we need, we forget about Jesus all over again. Why not? He isn’t “lord” of our lives. Something else is. Remember that great hymn by George Beverly Shea? Would we rather have Jesus than anything else—that we would be willing to say, “Even if it means my life, Lord, I’d rather have you”? Last Sunday, literally dozens of Christians, who are part of one of the oldest churches in the world, in Alexandria, Egypt, were killed doing what their brothers and sisters in Hampton, Georgia, were doing last Sunday—celebrating Palm Sunday. In spite of metal detectors and security guards who were trying to keep terrorists away from the church, a suicide bomber got in and blew himself up—and about 50 people besides him. Christians in Egypt have been targeted by terrorists plenty of times before. So they probably know that going to church under any circumstances can be risky—especially on Palm Sunday. Does my life prove it? I want it to. Lord Jesus, I want it to! But I confess I really like statues… in my honor. But you know what? Statues rust, corrode, fall apart. Some day—dozens of years from now, certainly hundreds of years from now—even that statue of Lucille Ball will be no more. Some day there will be no cable channel showing reruns of I Love Lucy. Some day Lucy won’t be remembered. And if that’s true for someone who was among the brightest stars of her generation, how much truer is it for the rest of us who were never any kind of stars? I like being remembered for doing great things. I want a legacy. I want silver and gold and riches untold. I want houses and land. But all of that will pass away. I want a treasure that lasts. Here’s the good news… So does God! Jesus tells a parable about a man who finds treasure buried in a field. The field doesn’t belong to him, so he sells all of his possessions and uses the money to purchase the field. He gives everything he has in order to acquire that treasure. Friends, Good Friday proves that, in God’s eyes, we are that treasure! Good Friday means that God gave everything he had to rescue us! This entry was posted on	April 15, 2017 at 5:31 pm	and is filed under Uncategorized.